Hello! 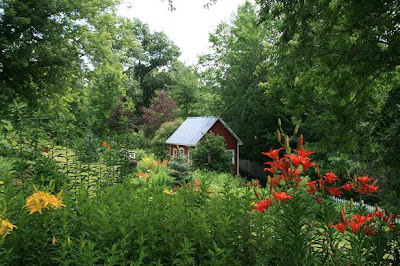 As most of my regular readers already know, I have been posting pictures of my garden as it changes through the gardening season. 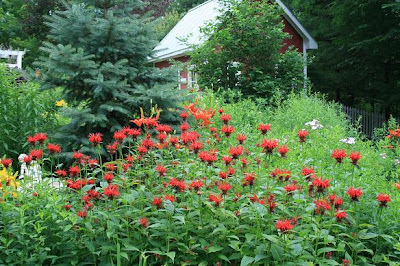 I have already posted pictures and stories of my Early Spring Garden, Mid-Spring Garden, Late Spring Garden, and Early Summer Garden. 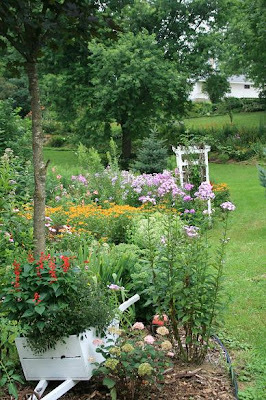 Today I am posting pictures of what my garden looks like in the Middle of the Summer when it is in Full Peak and probably the most beautiful of all. Here's a view of what my yard looks like from the road above. That is my garden shed below. 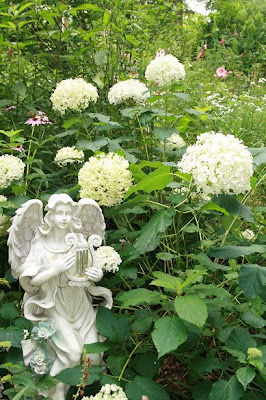 This is a Hydrangea Bush. I couldn't believe how huge the blossoms were! I wish I could have had some one's hand or head in the picture to show you the scale; but I was alone at the time of photographing. The angel statue is quite large, if that helps give you some perspective on how big those blooms are. A close up of my garden shed. The Black Eye'd Susans are just beginning to bloom, they last for about a month. 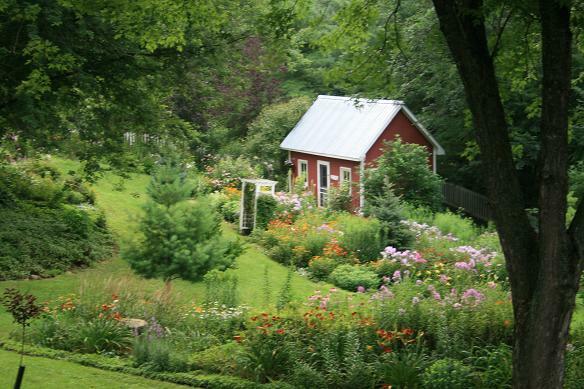 Here's a side view of that same garden. 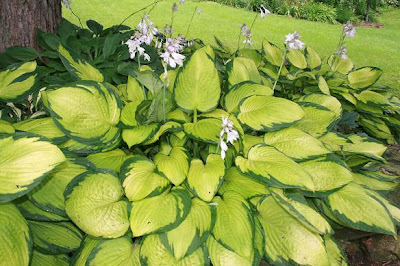 This is my favorite Hosta Bed. And this is my favorite Hosta. I love the Chartreuse color of the leaves. 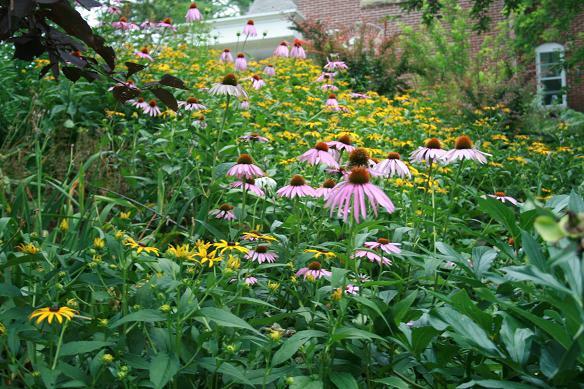 The Purple Coneflower is in full bloom now. A close up of the Purple Liatrus. 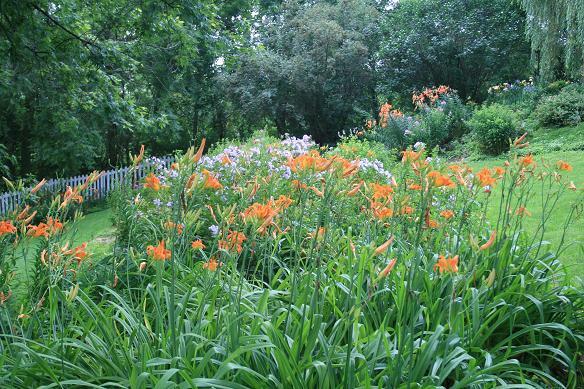 These are common orange daylilies grown in mass on my septic mound. 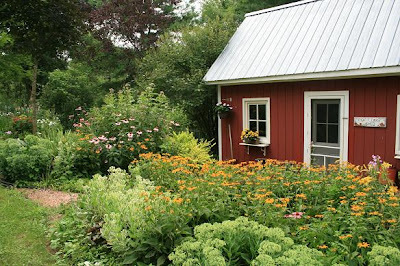 I hope you enjoyed seeing pictures of my Mid-Summer Garden. It's sad to think were at the peak of the garden season now, and soon everything will be coming to an end. Our summers in Wisconsin are way too short. Hello! Today I have a Paper Fashions card to show you that uses images from the set "Feeling Like a Cowboy Stamps" and sentiments from "Feeling Like a Cowboy Sentiments". They are available for purchase separately, or as a bundle. To make my card I used a sketch from the Clean and Simple Blog and some unknown vintage cowboy paper. I sponged the Chocolate Chip paper to give it more interest. The cowboy boots are up on dimensionals. And here is the inside of the card with another image from the set, the cowboy hat. It's finally cooled down here in Wisconsin a bit. So life is more enjoyable again! I heard our heat wave is now out East. Sorry guys! Hello and welcome to another Digital Tuesday Challenge. This week's challenge is a Sketch Challenge. Simply make a card or scrapbook page using the sketch pictured below and be sure to include at least one digital element. Our sponsor this week is Spesch Designer Stamps and they are giving away 3 digis to one lucky randomly chosen winner. To make my card I used the image 'Moon Baby' from Spesch Designer Stamps, designed by Sylvia. I printed the image 3 times and mounted the moon up once on dimensionals, and the girl three times. My paper is 'Sweet Fairy' by Prima. I cut my stars with a Cuttlebug Die and covered them with glitter. Three of the stars in the image are also popped up on dimensionals and covered in glitter. The brads are glitter brads also. Here is a close up so you can see all the dimension. I have a simple, but fun masculine card to share with you today. 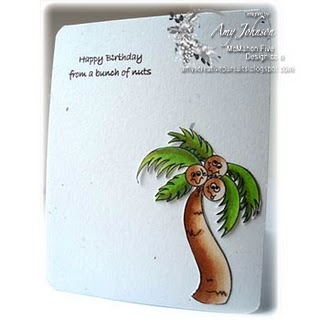 My images and sentiments are from Paper Fashions "BBQ Digital Stamps' and 'BBQ Sentiments'. These images and sentiments are available for purchase separately or as a bundle. I used paper from DCWV 'The Guy Stack'. I had a hard time to photographing this card. The color is much richer in real life. The male figure is cut out and popped up on dimensionals. Here is the inside of the card. I'm sure any guy I send it too will get a chuckle over it. I think these images are perfect for any guy who isn't into hunting or sports (yes, there are guys like that! ); after all, every guy eats! LOL! I have some church friends with an anniversary coming up, so I finally had the chance to use a stamp set that I purchased but never used: Crafty Secrets 'A Couple of Cuties'. I love this set, but one of the unfortunate things about being a design team member for other companies is that I'm so busy making things for my 'commitments' that I don't have time to make things I actually want to or really need; so, my beloved set sat neglected for quite some time. Hello! Today I have a fun image by Studio 313 called 'Coco Loco' It is sold at McMahon Five Designs. I kept my layout really simple; I thought the clean, pure colors were more 'beachy'. 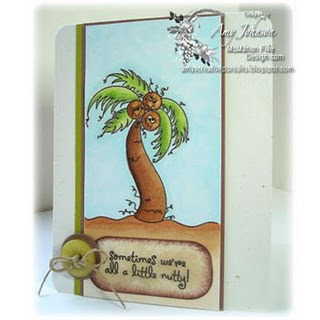 My layout is by Splitcoaststampers (SC340). The cover sentiment comes with the image, but the inside sentiment are stamps from my stash. Here is the inside of the card. I just cut the image out and adhered it to the inside of the card. Be sure to check out the McMahon Five Designs Blog to see the rest of this week's new releases, and while your at it, visit my fellow design teams members blogs as well. They are listed in my sidebar. Hello! Today I have a card for the July Penny Black Allsorts Challenge 'Flower Power'. It was a really simple challenge this month. All you have to do is make a card with flowers on it and be sure to use at least one Penny Black image. 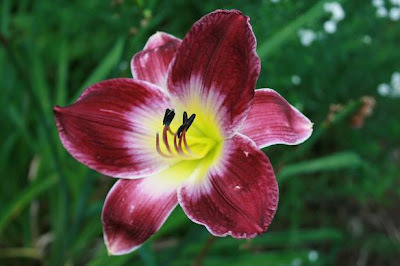 I chose an image from 'Garden Friends'. My sketch is by Verve. I stamped the image twice and popped just the flowers up on dimensionals so the little hedgehog really looks like he is popping his head out of a bed of flowers. I used an MFT Rolled Flower Die to make my own flower. 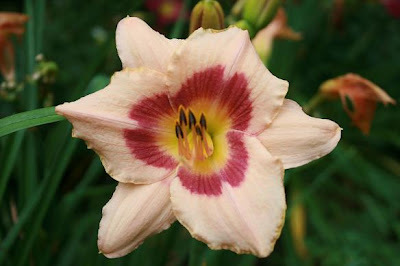 The paper is by My Minds Eye Stella Rose 'Gertie'. I put Stickles on all the flowers and the bee in the image, and a pearl in the inside of the handmade flower. I also decorated the inside of the card by using up some scraps and stamping a second image from the set. Hello! Do you have any fishermen in your life? Well, living in Northwestern Wisconsin I certainly do! So today I have a masculine birthday card to show you that uses the Paper Fashions Digital Set 'Gone Fishin'. Paper Fashions also has a great sentiment set that you can buy separately or as a bundle with the fishing images. Hello! As promised, I am posting photographs as my garden changes through the seasons. I've posted the Early Spring Garden, the Mid-Spring Garden, and the Late Spring Garden. Today I'm showing you pictures of what my garden looks like in Early Summer. 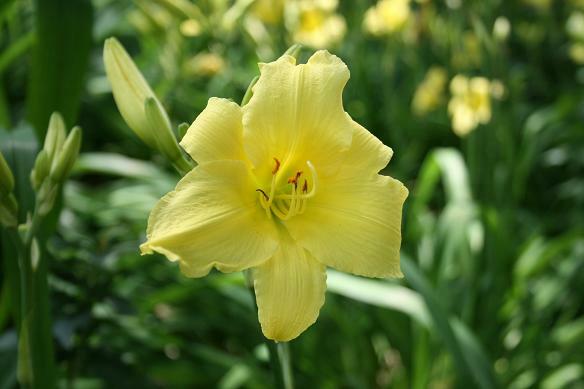 This is a yellow primrose. I love this plant because it grows like a weed, yet is not invasive. It will grow in full sun or in full shade. This is full shade pictured below. And it has beautiful red fall foliage. 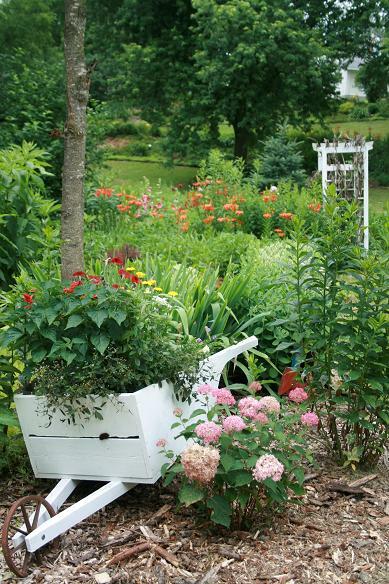 This is a wheel barrow full of annuals that my husband made for me. This is my main garden looking west. I just bought and planted that pink hydrangea bush, that's why it's so small. In a couple of years it will probably be 5 feet tall and wide. Things grow big and fast in my yard! This is a clematis that grows over a trellis in my main garden. You can see the trellis pictured in the back ground in the picture above. I have the best version of Bee Balm I know. 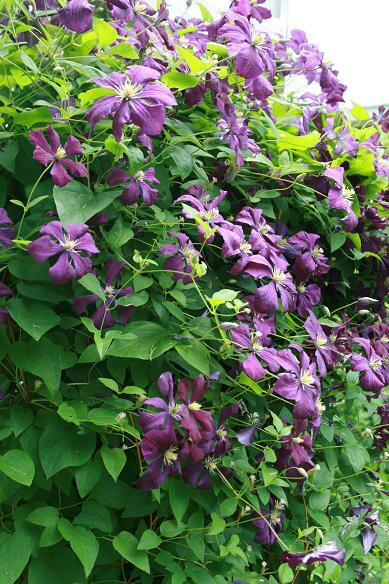 It grows so strong and tall and is mildew resistant. Sorry, but I can't remember the name of it anymore. 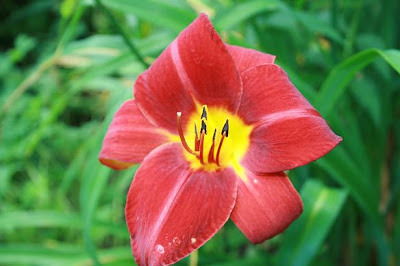 I use to know every name of every single plant in my yard, but as the years go on, the less names I remember. LOL! That blue spruce pine tree was probably only 12 inches tall when I planted it just a few years ago. Now its about 5 or 6 feet tall. I just love the color! A far away picture of my yard with my garden shed in the background and yellow and orange lilies in the fore ground. 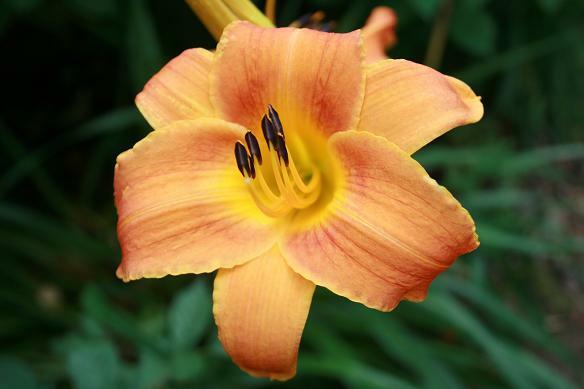 This is the first day lily to bloom every year. 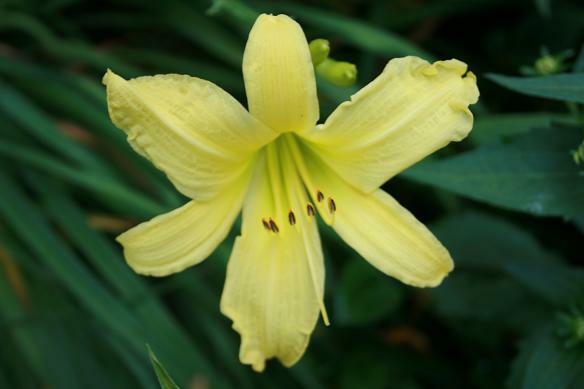 It's a beautiful pale yellow. I'm not a fan of rose bushes because they are too high maintenance. I love the flowers; just not the thorns or the work associated with their upkeep. 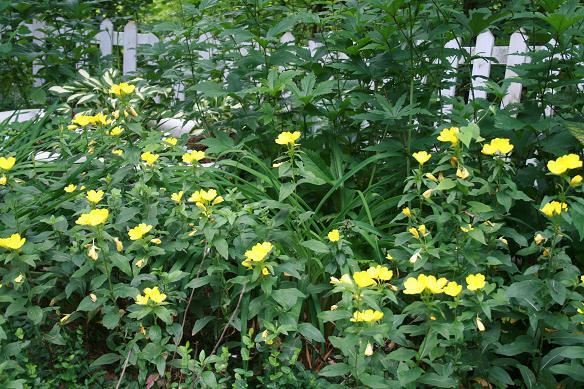 However, I do have about 5 hardy shrub roses on my property. 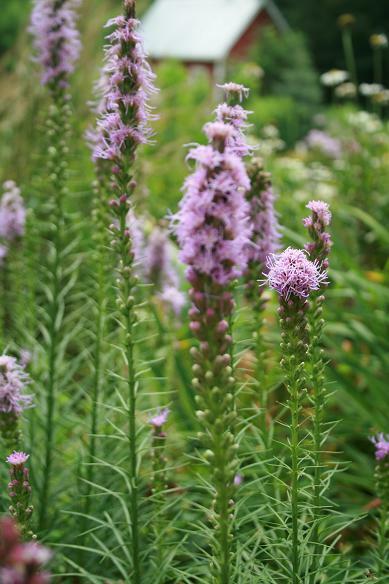 I love them because they require no maintenance whatsoever; I don't even have to cover them in the winter! 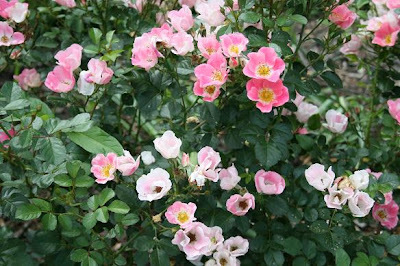 This is a light pink shrub rose. 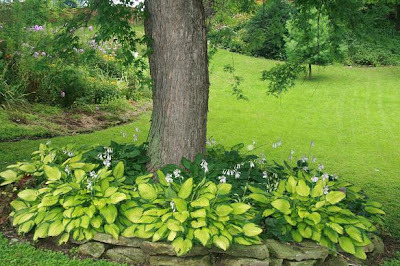 In previous posts, I've showed you many views of my garden from the viewpoint of my front porch; well here is the opposite viewpoint: what it looks like as you walk the path to my front porch. 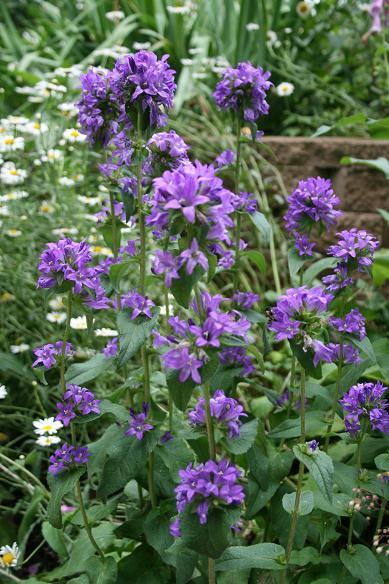 When I first bought the house, I always bought annuals that were red, yellow, purple, or white cause I thought those colors went best with my brick house. But when my daughter Ashley got married last year, she wanted all the annuals to be pink or coral (the colors of her wedding) and I ended up really liking those colors against the colors of my house, so I planted them again this year. I don't have any annuals in my big perennial garden beds in my yard. That would be way too expensive. 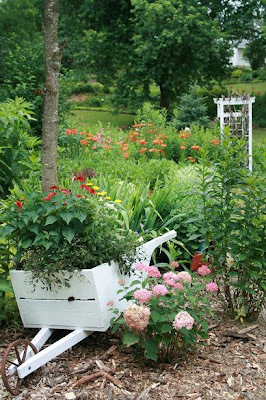 I only plant annuals in the walk way up to the house and in pots and baskets so that I have color all summer long where visitors see the most. I still spend an average of $1000 in annual flowers a year. 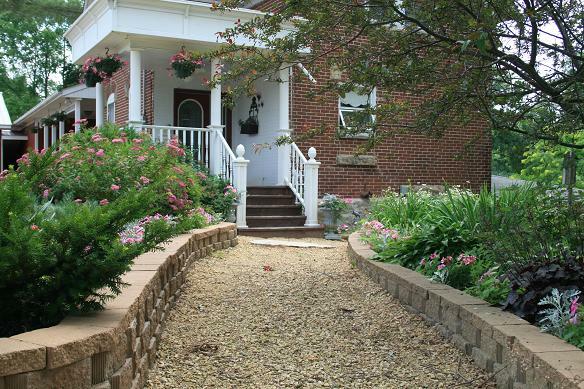 It cost that much to fill all that space plus my 4 porches and 14 hanging baskets. 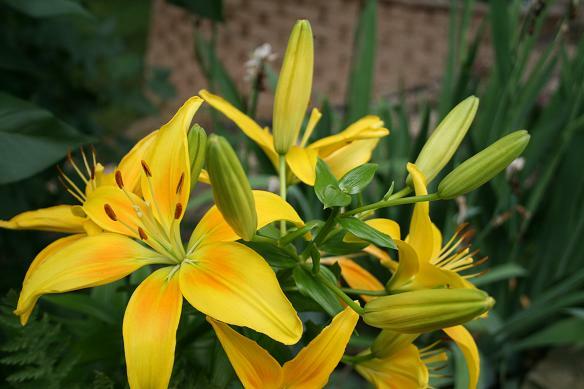 Here is a close up of my yellow lilies. 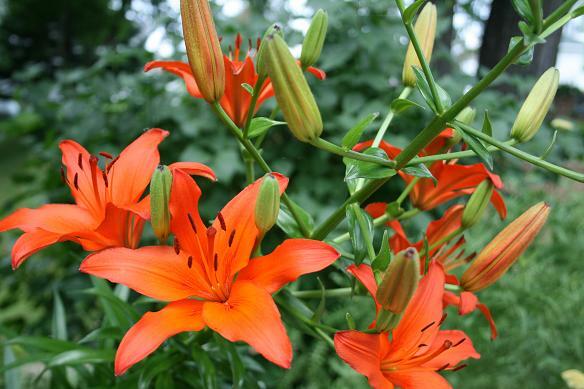 And here is a close up of the orange lilies. 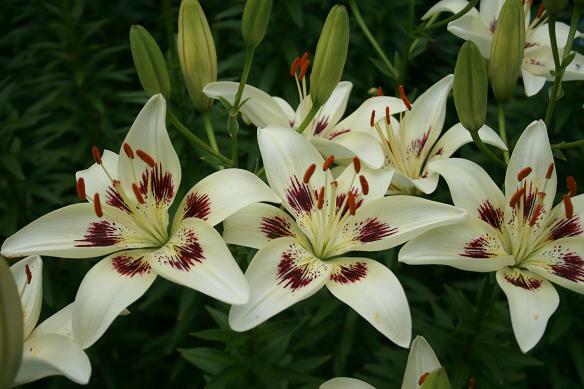 These are the most prolific lilies in my garden. 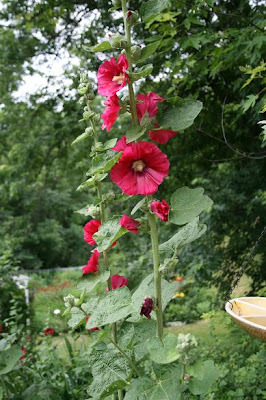 The Hollyhock are just beginning to bloom. 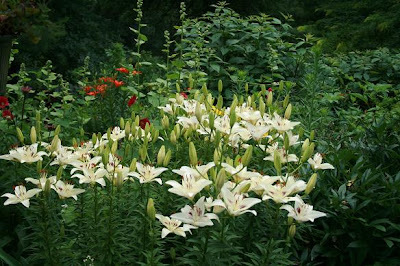 They will peak in Mid-summer and will continue blooming through late summer. I hope you enjoyed the Early Summer Tour of My Garden. I will have more pictures in Mid-Summer to show you! Hello! Due to the Holiday, I had an extra day off this week so I had some time to play in my craft room 'just for fun'. I decided to play the Doodle Pantry Digital Challenge. All you have to do is use a Doodle Pantry Image and link up your card to the site and you get a free "Peacock Birdie' digital image just for playing! And, there is still one winner chosen from all the participants who will receive a $15.00 Doodle Pantry Gift Coupon. Sounds like too good of deal for me to pass up? How about you? I chose the Doodle Pantry Image and Digital Papers 'Plush Panda' for my card. I colored the image myself with Copic Markers, although he is available pre-colored too. My sketch is 'I Love Sketches'. Isn't he just the cutest thing? Just love this set!